Noticing self-perpetuating thought patterns is a core mindfulness skill. Take a moment to examine how it feels to disengage from a busy mind and shift into "being" mode. The ability to recognize and disengage from self-perpetuating patterns of ruminative, negative thought is a core mindfulness skill. The basic tool to shift mental gears is the intentional use of attention and awareness. By choosing what we are going to attend to, and how we are going to attend to it, we place our hand on the lever that enables us to change mental gears. We can learn to switch out of automatic pilot by bringing our awareness to the present moment. The doing mode has a strong tendency to keep itself going and to reassert itself once the mind has switched to another mode of processing. It is particularly important, therefore, that the mode to which the mind switches after disengaging from driven–doing be incompatible and inconsistent with that mode, in the same way that it is not possible to be in forward and reverse gears in a car at one and the same time. Being mode is an ideal candidate for such an initial, alternative mode into which to switch. In the end, we need to balance being and doing mode in our lives. Whether it is because the culture we live in exalts doing, or because driven–doing is often propelled by automatic, well-worn routines, it can easily crowd out other ways of being with one’s experience. We can learn to switch out of automatic pilot by bringing our awareness to the present moment. When we do this, we start to see that we have a choice, and this is often the first step in taking care of ourselves differently in the face of sad moods. To practice shifting into being mode, try this 7-minute guided practice called Two Ways of Knowing from The Mindful Way Workbook by John Teasdale. Begin this practice by settling yourself in a chair with both feet flat on the floor. If it feels okay close the eyes. In this first part of the practice you’re invited to take a few minutes to think about your feet without looking at them. What thoughts come to mind when you think about your feet? Perhaps there are judgments about your feet. How much you like them? How much you dislike them? Perhaps there are thoughts about how you’d like them to be different. Maybe thoughts come to mind about the places your feet have taken you. Perhaps thoughts about problems they may have caused you. What thoughts come to mind for you? There’s no need to control your thoughts in anyway. Just let the thinking unfold naturally. Taking your time. Taking a few minutes now simply to let thoughts arise. And now, for the second part of this practice, the invitation is to gently bring your attention down the legs into the feet, sensing your feet directly without looking at them. Allowing your awareness to sink into your feet and fill them from the inside to the outside, from the bones, right out to the surface of the skin, perhaps sensing the many small bones within the feet, maybe feeling the sensations of touch on the skin, the sensations in the soles of the feet, the sense of touch and pressure where the feet make contact with the floor. Perhaps exploring with your awareness the boundary between the feet on the floor. And now, if you will, clenching your toes, drawing them in as close as you can, being aware of the sensations in the toes, the soles, and the body of each foot. Directly sensing the pressure in the toes, feeling the tightness in the muscles, the coming and going of sensations throughout the feet, ankles, and legs. And now, just relaxing the toes, keeping the awareness in your feet and noticing any changes in the sensations in the feet and toes as they relax. Before changing your position, taking a few moments to get a sense of the body as a whole. Zindel Segal, PhD, is Distinguished Professor of Psychology in Mood Disorders at the University of Toronto – He has pioneered the use of mindfulness meditation for promoting wellness in the area of mood disorders and has been continuously funded by the National Institute of Mental Health and the Canadian Institutes of Health Research for the past 15 years. 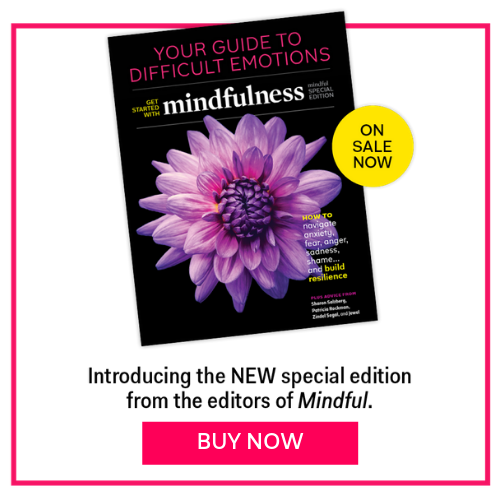 An author of over 10 books and 140 scientific publications, including The Mindful Way Through Depression – a patient guide for achieving mood balance in everyday life – Dr. Segal continues to advocate for the relevance of mindfulness-based clinical care in psychiatry and mental health.